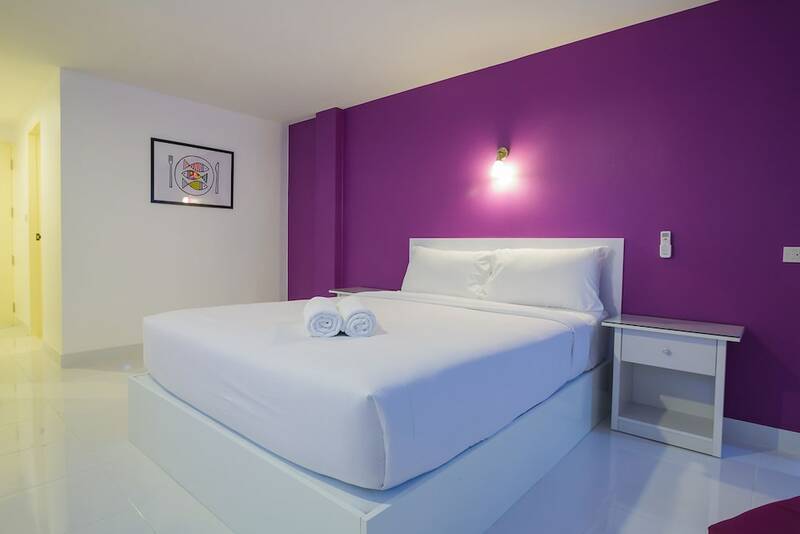 Located on Pratamnak Road in Bang Lamung district of Pattaya, Nova Platinum Hotel is just a 5-minute walk from Pattaya Beach and Walking Street. Travellers can access the property in a 45 minute drive from U-Tapao Rayong-Pattaya International Airport. Within a 5-minute drive from the hotel, the Ripleys Believe It or Not Museum, Royal Garden Plaza Mall and Central Festival Pattaya Beach Mall are famous attractions of the region. Health conscious guests can sweat out at the well-equipped fitness centre and can avail rejuvenating massages on-site. The hotel also features a swimming pool with a water slide. With a capacity to hold 120 people, the on-site functional Emerald meeting room is apt for a formal/informal event. Additional conveniences include an internet corner, jacuzzi, parking and free Wi-Fi access. Featuring parquet/tile flooring and floor-to-ceiling windows, the 270 well-furnished rooms and suites offer enchanting views of the city and garden. In-room amenities include flat-screen TV with satellite channels, writing desk, telephone, tea/coffee maker, DVD player and free Wi-Fi access. The on-site Kiara Restaurant serves delectable American buffet breakfast every morning, while Zia Restaurant offers a range of international cuisine. Besides, guests can enjoy light snacks and refreshing drinks at the hotels Pool Bar. Specialising in Indian cuisine, Indian Touch 1 Restaurant is opposite the hotel, whereas Annapurna Indian Restaurant is around a 15 minute drive away. Drive for only 10 minutes to enjoy delicious pizzas at Dominos Restaurant. Housing a large number of beautiful aquatic animals, the Underwater World Pattaya is hardly a 10-minute drive from the hotel. Book 1 night get 15% off Food and Non Alcoholic Beverage. Book 2 nights consecutive get free Breakfast for the whole stay. Book 3 nights consecutive get free breakfast upon arrival and the whole stay. Deal Applied: MMTIHMMTF. You Prices dropped, book now! I have stayed there for 5 days, my experience was good, best thing is Hotel ac, staff was also cooperative, guest entry free, walking distance to walking street and beach, next time I would prefer Nova. Hotel is excellent. Staff is very friendly. Bad service don't wanna go anymore. Hotel is on the main Road and very good location. 5 minutes to walking street. Very good for entertainment. Not suitable for family travellers especially with kids. Hotel is always jam packed with hookers as the visitors are mostly bachelors. Step out of the hotels and there are 100's of prostitutes standing on the main Road till 04 Am in the morning. 10 bath sharing tuck tucks are available right in-front of the Hotel. Swimming pool is very nice and big. Take the rooms in new wing. Travelling with friends for fun then this is the perfect Hotel. Travelling with wife and kids or family then avoid this Hotel. Rooms R small and toilet is smallest. Best Hotel to stay in entire Pattaya. Especially for indians. Great hotel and staff was good as well. Easily check-in and I really like the swimming pool. They should provide early checking if possible. Very good Hotel, best location, value for money, guest friendly, next time also stay there. Near by walking street and all most people staying in indians percentage high, that street all so majority people indians, swimming pools is good. Awesome place would surely come again, highly recommended for bachelor's. All amenities were easily available. The property was centrally located and the pool was very nice. The pool side bar was also nice and they have a good water slide. There were lots of Indian food restaurants just outside the Nova Platinum Hotel so food was not a problem. Overall a good stay. The room was good but barely had WiFi connectivity. Moreover, the security guard sitting near the lift was not able to differentiate between couples and guest women and keeps asking for visitor pass from the couple as well which they normally issue to visiting girls. Fair enough at a good price at prime location. Walking street and beach is at 10 minutes walking distance, can even catch tuk tuk just outside the Nova Platinum Hotel(to and fro) from walking street area. Indian breakfast was good. I recommend guests to add breakfast in the booking as I found Thai street food intolerable. Think twice before you keep cash in the locker provided as I lost my money but I should not blame the Nova Platinum Hotel as I am not very sure where I messed it up. The location was OK. Rooms were horrible with spider nets and baby spiders around. The rooms had spider nets with baby spiders around. The cleanliness was really not good. I booked a superior king room but was given another room which they told was deluxe but it was horrible. The exterior of the Nova Platinum Hotel was good but interior was worst. Nova Platinum Nova Platinum Hotel was a very big group of Nova Platinum Hotel but the service and room were worst. This Nova Platinum Hotel primarily hosts Indian visitors and the best part is that its completely guest friendly no charges for bringing lady to your room. Location is about 7-8 minus on foot from walking street. Need to improve internet connectivity of room WiFi for visitors. Its dead slow. Otherwise the overall experience was good. We were there for many times. Through other source of booking. This time booked via MakeMyTrip. I have booked the non refundable room via MakeMyTrip in wrong date. But guaranteed me that they will cancel the ticket and also provide me full refund. As they say they do. Good service. Hotel was well maintained. Very cooperative staff. Morning breakfast was good, location is near to walking street and most of Indian community in this Nova Platinum Hotel, but service was so poor after so many calls to room service and manager, no one provide drinking water and rest of night we was without drinking water. Have not provided drinking water to us. Have stayed most of the times at this Nova Platinum Hotel during last many visits and it's most affordable convenient Nova Platinum Hotel around walking street and has all basic facilities with in 100 meters distance. It's the best Nova Platinum Hotel near prominent walking street and very guest friendly. Hotel is perfectly located and the first choice of any Indian as the Indian restaurant is just opposite the Nova Platinum Hotel which serves food great in taste and also the lively walking street is at a walkable distance and Pattaya beach is also nearby. Hotel is good, two swimming pools. Rooms are clean. Try booking room with pool view. Many Indian food joints outside so no worry about food, staff is good and polite. Bike, Taxi and Tuk Tuk available outside, breafast is good and variety selection. Nice Nova Platinum Hotel to stay. Many Indian restaurants were near to this Nova Platinum Hotel. Swimming pool was also neat and clean. Bed size was really good and shower was not ok wall shower and ceiling shower both were running together. Hotel is peaceful and located at a right place but I feel its not a Hotel for family stay. Walking street and Pattaya Beach are located at a walk-able distance. Indian restaurants are nearby. Room was fine and Hotel staff was good. It was very awesome, Nova Platinum Hotel was superb with cooperative staff. Located very near to walking street, room is clean and good. Amenities are good. I really likes the way they designed the rooms. It's really awesome and the location is very good to access so many places easily in pattaya. Good Nova Platinum Hotel, good room, bad staff, big size room. Nice Nova Platinum Hotel with inside pool view. A well maintained room. We should choose grand deluxe room only at this Nova Platinum Hotel. Very nice Nova Platinum Hotel, I stayed there very comfortable and joyfully. Best location to roam around Pattaya. Nice place for family as well as business trips. Staff is supportive but food is costly. Good location walk-able distance from walking street cooperative staff. It was a relaxing and soothing stay of mine with a family worth staying. Fantastic. Nice and clean rooms. Mr Johan was too kind. Pool was clean. Staff very cordial. Security rating is excellent. Experience is excellent, We are satisfied, thank you very much for MakeMyTrip. Very good Nova Platinum Hotel, staff and view. Good location near to walking street. Location good near walking street large swimming pool and everything near by. Good Nova Platinum Hotel and great for stay.